Built in 1932 and converted in 2006, D4 is a 24-unit luxury condominium building located in historic District 4 police station Boston's South End. The common amenities of this property include an on-site concierge service, elevator, private and secured garage parking, a glass-covered winter garden on the roof deck, and interior common spaces designed by Philippe Stark's studio. The units range from 1 to 3 bedrooms featuring Bamboo floors, high ceilings, in-unit laundry facility, and elegant high-end quality finishes. Located in the heart of South End, D4 is within walking distance of dozens of colleges, hospitals, restaurants and shopping venues. Easy access to public transportation and major highways. Contact us to learn more about these D4 luxury condos in Boston's South End. Rarely available home in South End's coveted D4 building. 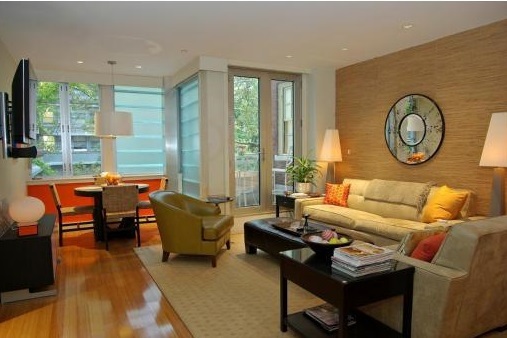 This beautiful penthouse duplex home offers approx. 1998sf of living space with 3 bedrooms and 3 full baths, a sleek kitchen featuring an oversized marble island with stainless steel appliances, a beautiful living area and dining area with a gas fireplace and built-in bar, and a custom built work office station. The master bedroom suite boats a gorgeous marble en-suite bathroom and a large walk-in closet. Each bedroom has excellent closet storage and the en-suite guest bathrooms feature marble finishes throughout. Enjoy direct access to your private roof deck, perfect for entertaining as well as your 2 heated garage spaces, and a one-of-a-kind lobby designed by Philippe Starck. A great opportunity to live in the heart of the South End, steps to shops, restaurant row, public transportation and everything the neighborhood has to offer. Stunning and unique 2+ bedroom residence in the highly coveted D4 condominium building includes two full garage parking spaces accessed directly from the unit! Ideally located blocks from the Back Bay and just steps to the best of the South End's restaurants, cafes, shops and theater, this spacious 2 level condo features a dramatic open concept living and dining area with handsome chef's kitchen, tall ceilings and walls of glass. Private master bedroom boasts a large walk-in closet and gorgeous ensuite marble bathroom. Guest bedroom with generous storage overlooks the building's spectacular atrium designed by the world-renowned Phillipe Starck. Incredible lower level space with skylights is ideal for additional guests and includes media room and home gym. Professionally managed building is meticulous with on-site concierge during daytime hours. This special home is a pleasure to show, by appointment only.